I saw this and thought immediately, Smartmobs! (Update: Unforetunatly as commenters pointed out this is more akin a flash mob than a smart mob. Stupid!) Not that these are technically smart mobs flash mobs, but they very well could be. This is something I haven't seen before, it's not an entirely new kind of smart mob flash mob but a natural evolution. People gathering from nowhere for a silent observance and a peaceful protest. Action with a message. Participatory language. I must say I like this idea of it. It's not confrontational, it's legal, and yet it's a show of solidarity and a quiet observance. Sort of like critical mass bike rides it's marked by simple legal participation, or at the very least benign civil disobedience. I suppose if you had enough people it might even be considered a DOS, a social denial of service attack. "Whirl-Mart Ritual Resistance is a participatory experiment. It is art and action. It came into being in 2001 as a response to Adbusters magazine's call for foolish action on the first of April. What began as a single happening in Troy, NY has over the course of a year evolved into a ritual activity that is performed across the U.S., and known around the world. 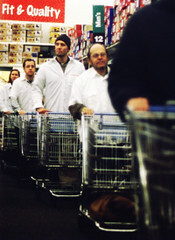 It is a ritual during which a group gathers and silently pushes empty carts through the aisles of a superstore. Whirl-Mart utilizes tactics of occupation and reclamation of private consumer-dominated space for the purpose of creating a symbolic spectacle." This is the English Whirl event, but there are also clips from New York and Sweden at the original demandmedia page. Enjoy. I don't condon it, I study it. I think you mean "flash mobs." On a very much related note. Planned social hackery. I love it. Or, in sociological terms, when Mr. Todd brought together 40 people to dance on his cue at the listening stations at the Virgin Megastore in Union Square or when seven of his agents rode the No. 6 subway last month without pants while giving no indication that they knew each other, it was a benign form of norm violation. Mr. Todd is 'breaking the unwritten laws of everyday life in the city to get people to appreciate the moment,' said Harold Takooshian, Ph.D., who teaches urban psychology at Fordham University. 'As long as he doesn't go dark - and these things can degenerate pretty quickly - this is urban humor at its best.'"